Lance, I remember in another thread pretty long time ago, you mentioned that push press destroys bench press in terms of carryover to basketball. Not disputing this, I'm just curious as to why and how? Strictly for knowledge sake since I'm a basketball player. When you block a shot, shoot a jump shot, go up for a rebound, fight for the ball, are using the muscles used in a movement more similar to a lower and upper body explosive movement, or are you using a prop to brace your upper torso against, and no leg drive? The bench press is a good lift and has it use, but the push press destroys it in carryover to athletic movements. Ive never seen someone push press a lot of weight who wasnt also strong at bench press. Lots of good bench pressers dont have the core stability, lower body explosiveness, and timing to push press two wet socks. What would you say is a good number for push pressing? 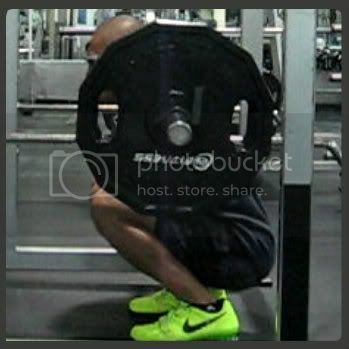 For example, 2xBW for squats is a good milestone, 1.5xBW for bench is considered really good, what about push press? My goal at a 152-155lb BW is to do 135 for 3 reps. Would that be considered adequate? Push pressing your bodyweight for a few reps is a good goal to start with. When you can do that you will tend to not have problems being stronger than the majority of players you compete against. if you want to save your shoulder/wrist joints the beating, do standing overhead DB press instead. get to 80lb+ and be boss. basketball players who benches 3 plates is nothing special.. you standing press at least 185+..you'd be a lot stronger for the sport. I definitely vouch for the push press, as I feel it did help me with being more physical and being able to absorb more contact while finishing during drives and layups. But if you push press watch for shoulder health and do work for the external rotators and stretch the shoulders, pecs, traps to avoid impingement. horseshit. Standing press is a good lift but pales in comparison to the dynamic correspondence to sports that the push press gives. You also dont have a good frame of reference to make the last statement, a 315 bench press is pretty rare even in high level basketball. and, one of the good thing about the push press is you still get the external rotation at the top of the lift for the shoulders, without the stress from the very bottom, where most issues occur, due to the drive from the LEGS. So its actually safer for the shoulders, done correctly. ^ i've been wrong before..
Well if you had said, for building the shoulders the press will be a bitter option, you would have a strong case. The thing with the push press is that it involves leg drive in a very similar manner to most athletic movement, and allows more weight, while having to also stabilize the body during that dynamic movement against the ground. The shoulders are put at a better leverage point from the leg drive, and you still get all the external rotation at the top. Pretty hard to beat for an athlete. For physique enhancement, not really necessary. my push press to press gap is too much its just embarrassing. thats why i prefer to build shoulders more. and i stand with my dislike for the bench.. id rather press 225s than bench 315s. but thats just me.